In my classroom, we have set up a Science center where we leave magnifying glasses, objects for the children to look at, and a few books for them to read. Clipboards and writing utensils are left at the table as well so that observations can be drawn and recorded. 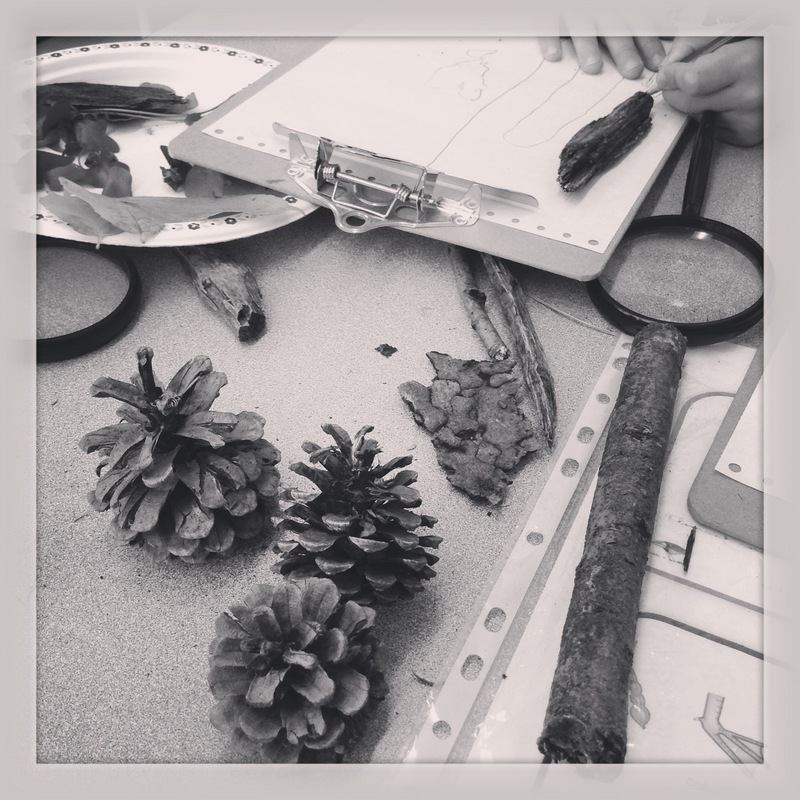 Once the children have completed their observations, I speak with them and ask them what they have recorded. I write down what they say as they are explaining their thoughts to me. The sheet of paper is then placed in their portfolio to be referred to when I write their report card – and also for the parents to see that they are learning and exploring in their kindergarten class. Do you enjoy looking at things as a scientist? There must be some smile making words and descriptions you record from listening to your little pupils ! I can understand why you have not visited often lately Paula. You have, however, continued hosting your interesting challenges – and those are always a pleasure. As a kid, I had no interest in science. But I fell into working in it as an adult and I love it. There is no better field for constant learning! I am wondering whether you would have visited a Science Table as a child. I have noticed that even boys who are solely interested in construction, take the time to visit the table when new things are available to look at. I don’t know. I do recall never being able to see anything through a microscope and that the things i dissected all had some weird tumor and never looked like the pictures. I guess Science is a little different in kindergarten. What we wish for is that their natural curiosity encourages them to think about the things that they see around them. And to investigate those things that they do not. Yes, you’re right. It’s the time to show them the wonder! I would be most interested in hearing what these little students had to say! The children find it to be interesting. And when you have plenty of visitors to the science table, you know that you have brought out something that will whet their curiosity. good work, Colline – do you know the Summerhill project? No Frizz, I can’t say that I do. Thank you for telling me about him Frizz. I of course read up on him and, as you noticed, I agree with what he believed – especially the belief that children can become self-regulating. self-regulating is so important but unfortunately not every teacher is open-minded enough for this goal! That is so true. It is a part of the kindergarten curriculum here but I have practised it when teaching other grades too. If one gives the child the opportunity, they are able to be responsible for their own learning activities and behaviour. A magnifying glass is the portal to a whole new world. I started with one then moved on into the world of microscopes. That small magnifying glass led me into many interesting Medical fields throughout my life. Who knows whats in the minds of the little ones, maybe a cure for Cancer. It would be wonderful if I could add a microscope to the table Ian. What excitement there would be. I hated science when at school but then I didn’t have YOU for a teacher ha! Very interesting and lots to learn and explain to the teacher and also each other, isn’t it? You make me feel excited to see and hear what the kiddies have to say! I’m convinced there is no other way kids look at things. Seems it takes years of reprogramming to get them to look at things otherwise. I love their curiosity Alex and it saddens me when I see it disappear. It is with that curiosity and way of looking at things that they enjoy their learning and discovery of new things. Thank you Jo. I need to try and take more shots like this one – guess I need to learn to be a little more adventurous. I always loved to learn, but also to get the answers, the reason why things are the way they are. Getting them to explain their thoughts is wonderful too, it teaches them to share their thoughts with meaning. Delightful read! Thank you Wendell. Getting them to explain their thoughts also helps them to solidify them as well as practice expressing them. I am always looking for ways to keep their learning interesting for them Christy. If I succeed then they enjoy going to school. Cheers to your efforts at starting them young with science. Thank you Frank. One can only hope their interest continues into the higher grades.